Gil Cedillo’s Incompetence Highlighted at Upcoming Press Event, May 12, 2016 at 2 p.m. This Thursday, May 12, 2016 at 2 p.m. at Avenue 55 Gil Cedillo is doing a press event that will include: unsuspecting school kids, a phalanx of city staffers, and select media invitees. Nobody invited to the event will cite the cost of $250,000 for the lights as being equal to the cost of a road diet for the entire street. Nobody invited will highlight how the other pedestrian deaths at Avenue 26 (William Matelyan in 2014), at Marmion Way (Jose Luna in 2015), and at Avenue 60 (Andres Perez in 2015) all took place in marked cross walks at intersections with traffic lights. More traffic lights add to the problem of motorists speeding between red lights. More traffic lights mean more traffic. More traffic lights mean that the money that could have been used to improve 2.1 miles of street is now being used to paper over horrible design decisions at one intersection. 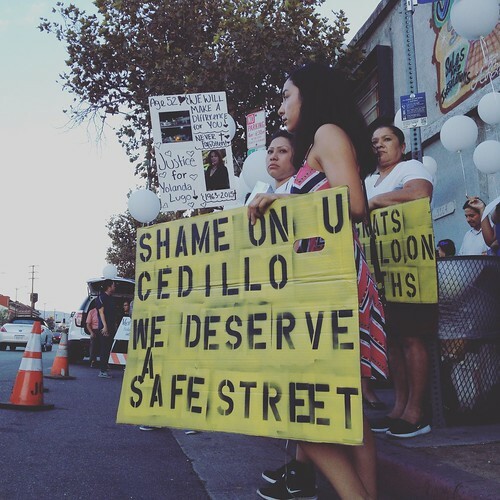 If you weren’t invited to Cedillo’s potemkin press event, show up anyway. Tell the story that needs to be told. It is not okay to feign interest in the very real concerns of people in this community. The street will still have excessive speeding between red lights; it will just have more traffic and pointless waiting in between bouts of unsafe speeding. Take the time to stop by Avenue 55 on Thursday, May 12, 2016 at 2 p.m.!